Front, or top view, as looking from the top of the tube. K0-K9, on the inside orange disk is the physical location of those 10 main cathodes, where the glow will reside. The numbers on the outside of the orange disk, is the pinout, as viewed from the top. Pinout chart on the side shows electrical pin assignments. Example: Pin 12 aligns physically with K1, though K1 is electrically tied to pin 13. 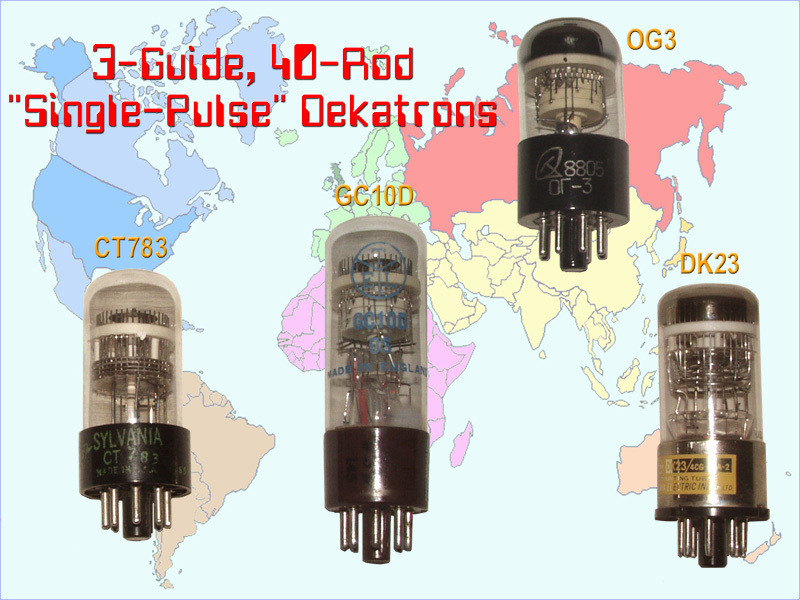 More often referred to as Single-Pulse Dekatrons. These were the first version of high-speed dekatrons. High speed meaning ~20KHz to 30KHz, as opposed to later high speed types, that went as high as 100KHz (2-guide), and 1MHz (1-guide). Standard speed being around 5KHz. The 3rd guide, meant that these tubes had 40 cathode rods, instead of 30. Above is the original intended drive circuit for this type (single pulse) of dekatron. Issuing a negative going pulse, goes to guides G1 & G2. G1 has an RC (differentiator) pair in the path, which speeds up the pulse, so the glow transfers here first. Just a few microseconds later, the glow is shared with G2. Upon the end of the pulse (it rising), G1 again will get there first, so G2 now has the pulse all to itself. A few microseconds later, it too will go positive. The glow, now will transfer to the closest cathode, that is more negative. That will be G3, which is sitting at ground (0V) level. G3 is tied to Gnd, thru an RC pair, too. Once it gets the glow, its also starts conducting. This will cause the voltage across that RC to rise, also raising G3. At some time later, that voltage will be high enough, so the glow will finally transfer and rest at the next main cathode. 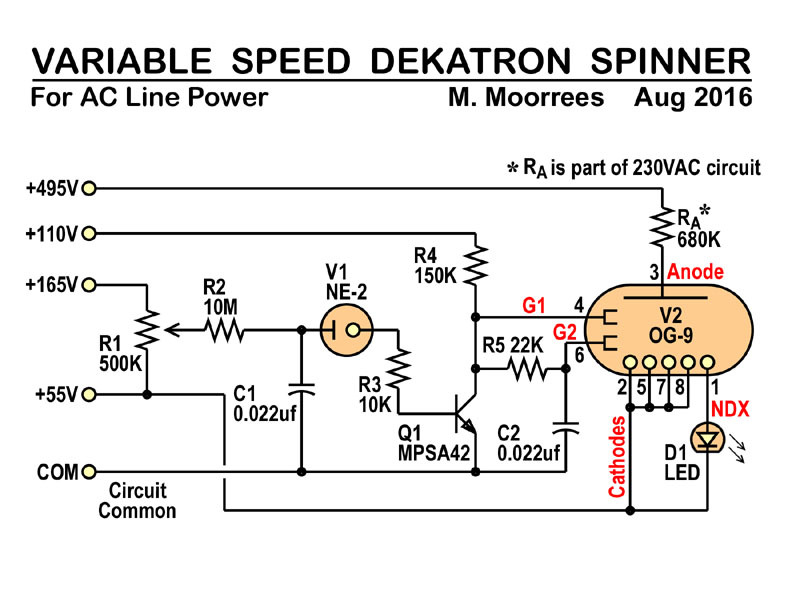 This is quite a different drive circuit from the standard 2-guide (double pulse) dekatron. Of course, with modern circuitry, we can just ignore using this type of circuit, especially using something μC driven. 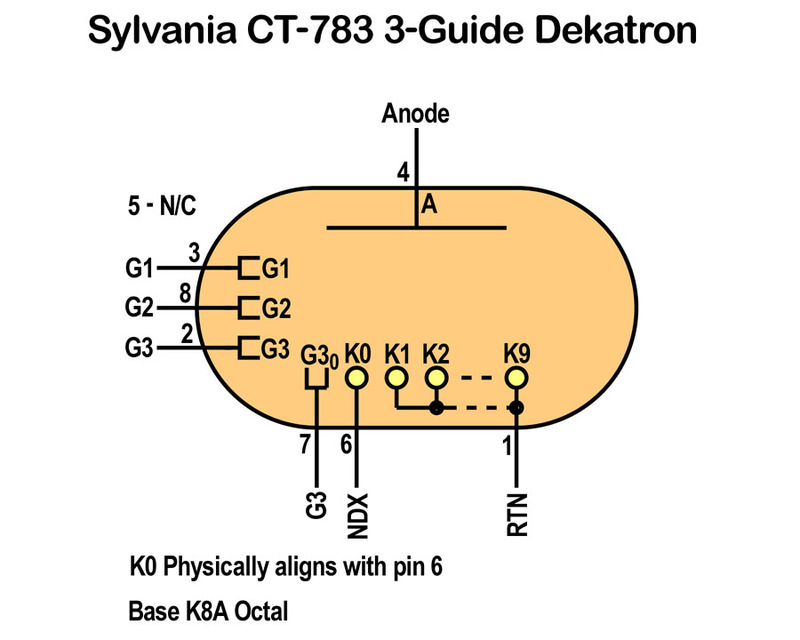 Above is the nominal range that a typical 2-guide neon filled dekatron can operate within. 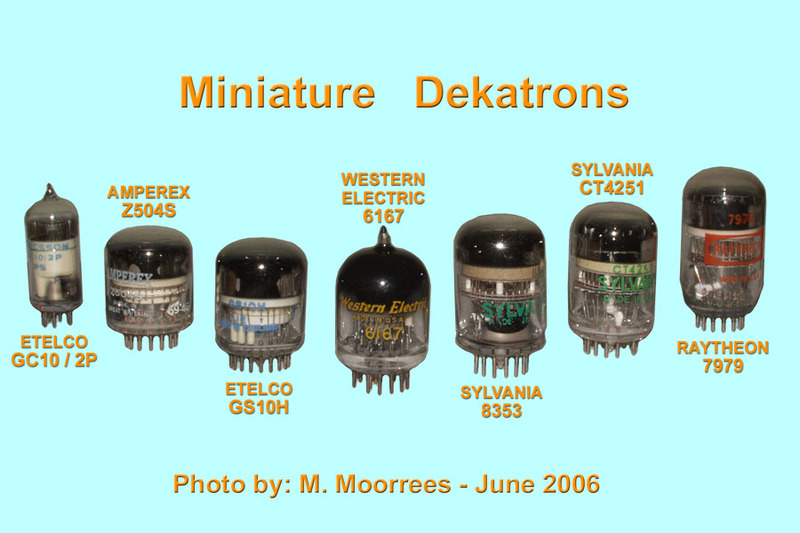 The dekatrons above are all roughly the size of a 6J6 (ECC91) vacuum tube. The GC10/2P, was the first of this size, and the 6879 was a close second source. Both are 2-guide standard speed dekatrons, though due to the size, they are only to be operated upto 1KHz. 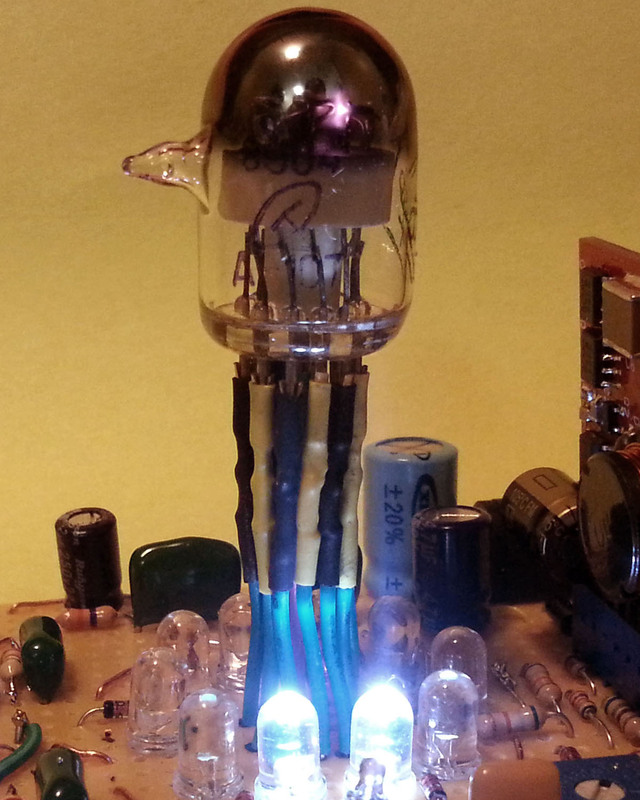 The ZM1000 is a nixie, not a dekatron, and only included as a size reference. The EZ10B is a single guide dekatron, which uses the guide shape, in place of two guide sets, to route the glow direction; clock-wise only. 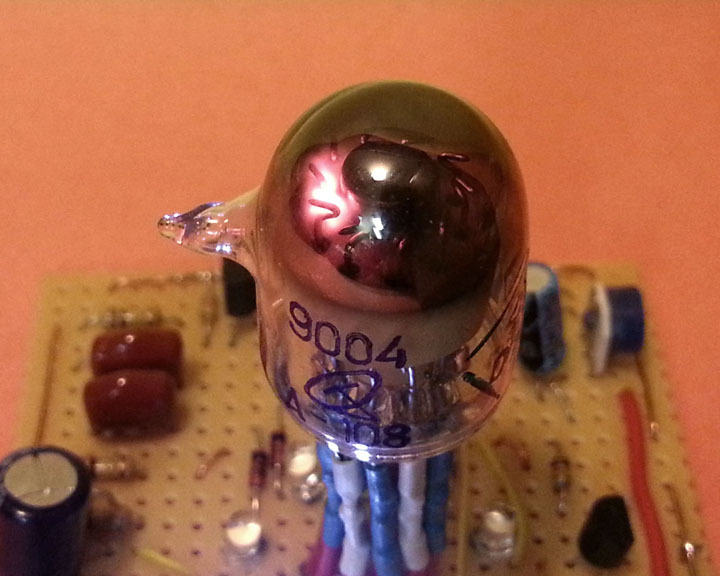 That, and the gas mix of hydrogen, instead of neon, allows this tube to clock at close to 1MHz. The fastest dekatron ever made. Unfortunately, by the late 60’s, a semiconductor IC counter, like the 7490, could count at close to 30MHz, and only require a 5V supply. Plus by 1970, a TTL counter cost less than a dollar, while dekatrons still cost more than $10. Doesn’t take a rocket scientist to see which technology would prevail. Here are more miniature types, that came to market, by the 60’s. The fatter ones are close to the size of compactrons (a GE form factor). Compactrons, however, have twelve pins while these mostly have 13 pins. The GS10H has 17, and the WE 6167 has 19. 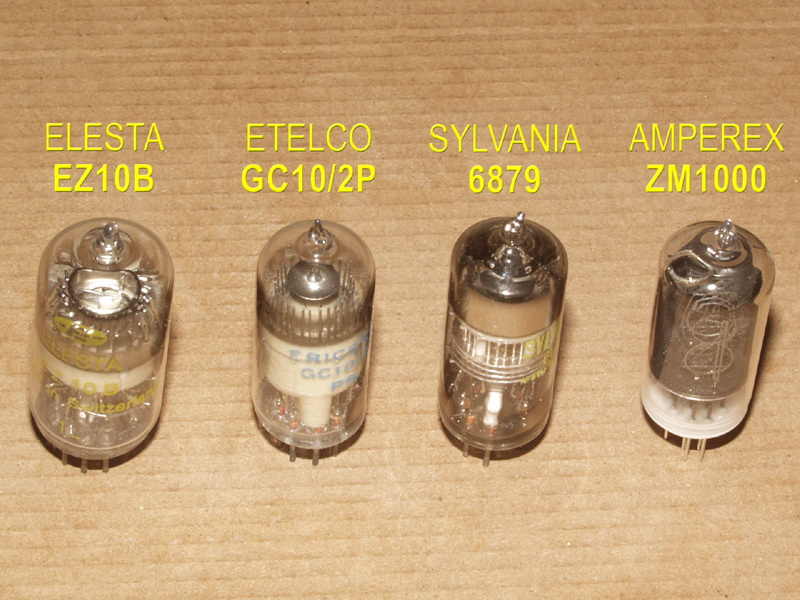 Most of these tubes have sockets that are damn near impossible to get nowadays. Only the GC10/2P (the skinny one of bunch) uses a common 7-pin mini glass tube socket. Note: that the voltage appears to be tripled for the 120V (110V, 115V, 117V) circuit, though it looks like a common doubler. It IS a doubler. The magic is in the source voltage. The 120VAC, is actually a 330Vpp wave. Its the Peak-to-Peak value that gets doubled. But here its 330V added on top of the 165V half wave rectified. 165V is the peak value of a 120Vrms. 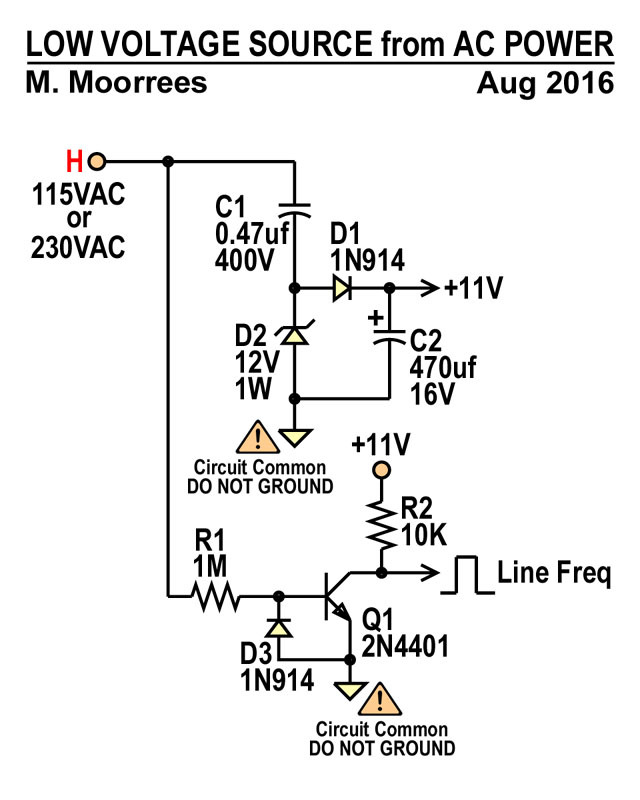 In the 230V circuit, its only doubled, but a half wave rectified voltage is also provided. in the 230V circuit, we are adding nothing on top of the 660Vpp wave. Only offseting it up 330V. Note, the red voltages, by D2, in both circuits. Neon Relaxation Oscillator Variable Speed Dekatron Spinner powered directly from AC line (above). Uses either the 115VAC or 230VAC power supply, two drawings up. The anode resistor, Ra, is required. For 115VAC use the 680K shown. For the 230VAC supply, Ra, is part of the supply circuit, in the form of the 2 1.2Meg resistors, RA1 and RA2. Relax Osc Spinner, using a 0A5 Gas Trigger (above). Similar to 556 circuit, but uses a LM393 Dual comparator chip instead. Tube based power supply, for running dekatron spinner circuits. Below, is a circuit showing how to drive a dekatron with a GTE175M gas trigger. This trigger was specially designed for dekatrons. It can take the 20V pulse from a dekatron, and boost it to over 120V, in order to pulse a successive dekatron. Note how the cathodes are in two groups, KE & KO. In the first circuit, one group, is tied to a simple RC network, while the other group is commutated (pulsed). For more uniform stepping, an astable multivibrator, with complimentary outputs is used. From some more experimenting, I found that the A108 will work with anode supply as low as 250V. Maybe even lower. The 555 circuit shown, has a duty cycle very close to 50%, and the glow is uniformly share between the odd and even cathodes. 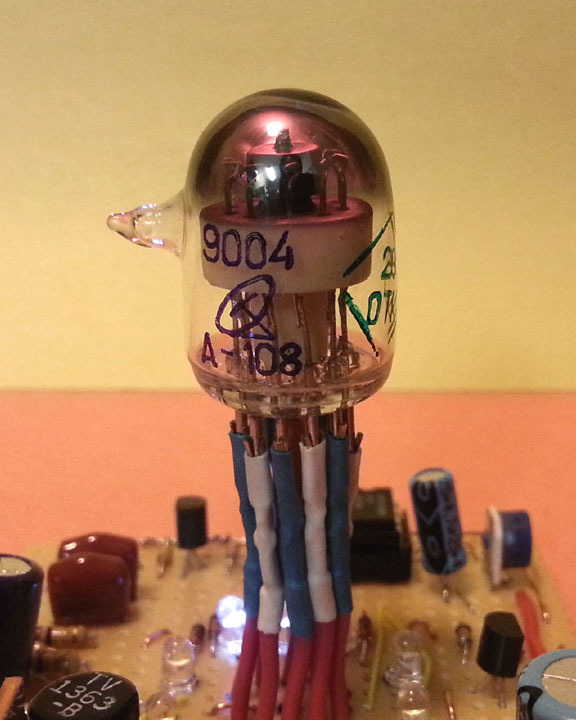 The cathode resistor, on KO can be as low as 4.7K, but not all the way down to zero. This circuit has a 20:1 speed adjustment range. The two complimentary pulse groups, KE & KO are isolated from the cathodes, with BAV21 diodes. The pulse sources, are normally biased up at ~+25V. This keeps the diodes in reverse bias, so the pulse sources are effectively isolated. The complimentary, pulse sources, also go thru capacitor differentiator, which make narrow pulses, that are biased, so that they will go below zero (negative). When less that zero, the diodes will be in forward bias, and drag on set of the cathodes down, causing the glow to transfer. Since its only a narrow pulse, the cathodes, will resume their ouptut function, in short order. In a real usable circuit, those outputs will be the BE junctions of NPN transistors. 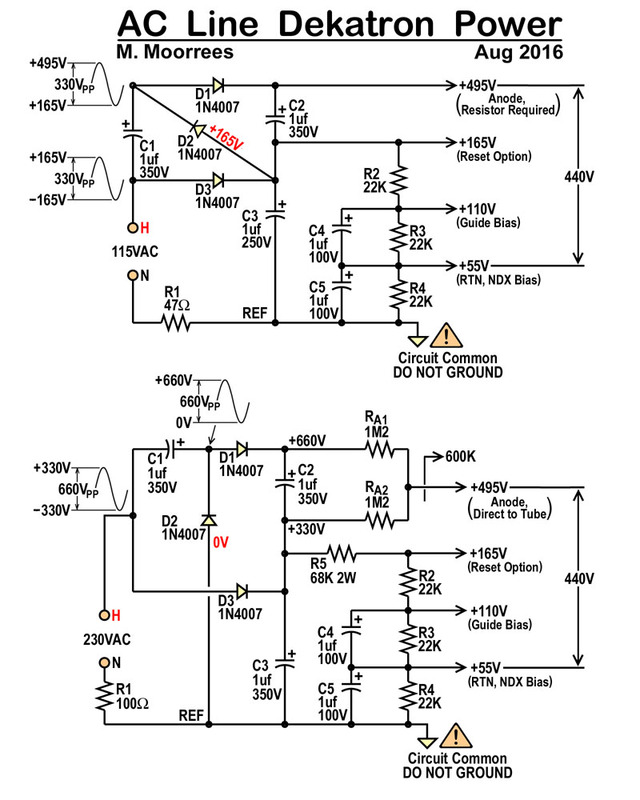 In this demo circuit, the BE junctions, are LEDs. Click here to watch video, of the circuit in action. The A107, is similar to the A108, but it barely glows a dim purple. It needs 500V versus 300V for the 108. And at that 500V, it needs to draw 1.5mA. Also, I use stepping pulses of ~120V, biased so that it rests at +60V, and steps down to -60V. Click here to see a video of it in operation. In this version of the circuit, the count transiently reaches 6 (Q7), which goes low, but not low enough to turn Q8 off, and therefore, leave only cathode “0” connected, and at the lowest potential of all cathodes. By adding two more transistors, Q7 will turn ON Q9, when it drops just below 20V. Q9 in turn, turns ON, Q10. Q10 is in the same phase as Q7, but it can fully saturate, and drop to less than 0.5V. This is more than enough to turn OFF, Q8. Here is the video, of the Divide-by-6 version.